and fluffed it along the way. I am most happy with my new living room centerpiece. you already know my affinity for morning coffee and candles. My new winter center piece is one of my all time favorites! it doubles as a flower arrangement as well. for the longevity and second life they can have after the party. so they worked in perfectly in this centerpiece arrangement. 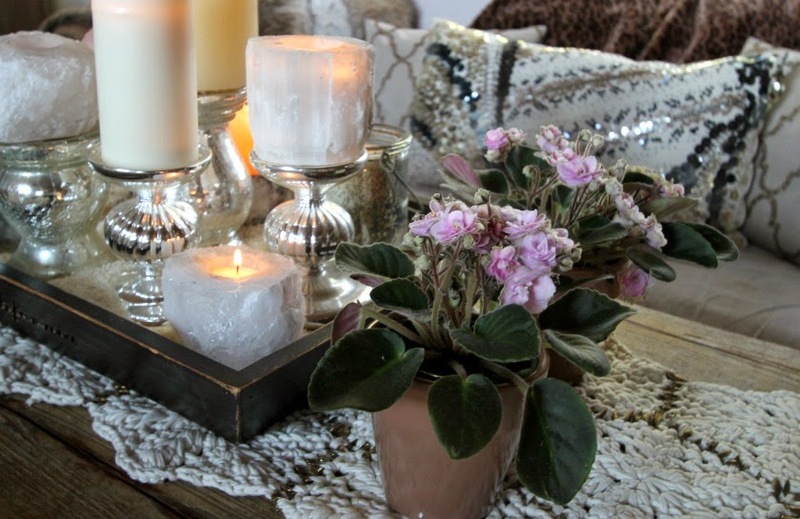 creating a perfectly cozy winter ambiance. Returning the arrangement to it's original beauty. This centerpiece arrangement is currently my favorite piece in my living room. with 4 more of my favorite winter candles. that were left over from the party. the quiet winter morning hours. Relishing in life's simple beauty. Beautiful, you are the queen of stylish living Tamera. Coming from you dear Tabitha … that is quite the compliment! Your candles are so pretty....I'd never even think to light them in the morning. 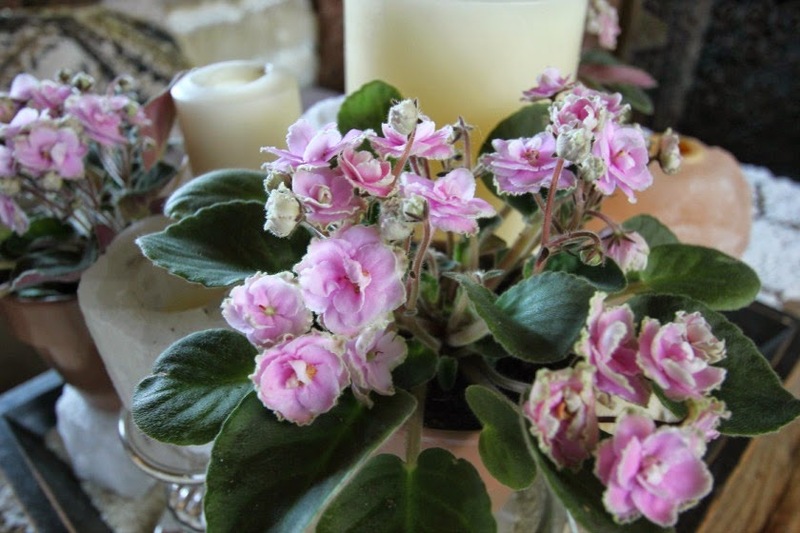 African violets are so delicate too and the soft pink is soothing. I can see why they are your favourites. I started this ritual so many years ago, when my children were little. It was the perfect way to prepare for my day with my three. It is still my favorite part of my day … It give me clarity for my day… and moments of happy reflection. 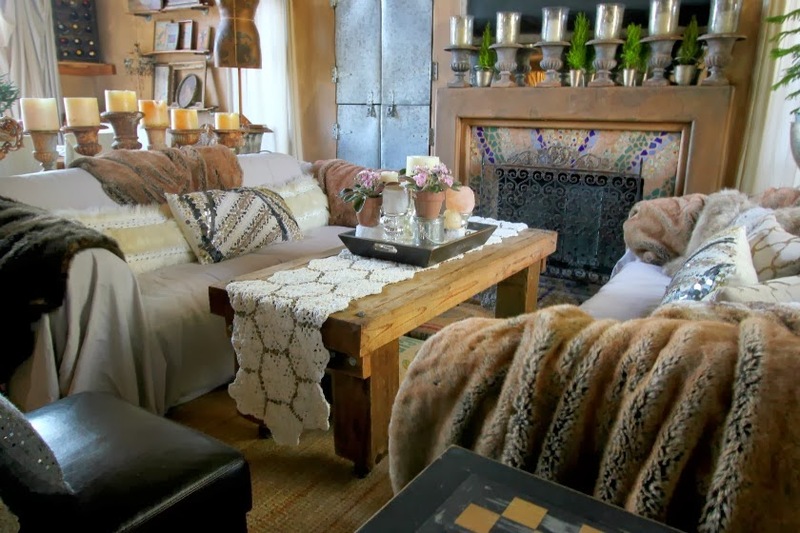 So inviting, beautiful, and cozy! I love this room and your new decor! Happy Wednesday, Tamera! Thank you Pam! And a happy Wednesday to you as well! Your centerpiece is beautiful. Rice! I would have never thought of it. Oh, and I just read your previous post on mothering your three. I mentioned the other day that I raised three boys and I had three under three for nine very long months. Do not remember much about it other than never being able to shave both legs at the same time. :) But your post hit very close to home in other ways, too as I was very busy throwing myself a pity party yesterday. Staying home to raise children does not do anything to improve your job resume for sure. I will reread your wise word. They helped putting everything back into proper perspective. For that I thank you. Oh Cornelia … three boys under three … that calls for a medal of motherhood valor! I salute you my dear! Yes, the dreaded pity parties … no fun at all :)) I find the best medicine for them for me … is to drench my heart in gratitude and beauty. Always so happy for your visit my dear! What a lovely morning ritual! I found your blog through Faux Fuchsia and can I just say what an inspiration you are. Sally, welcome … so happy for your visit! If you found me through the fabulous Faux Fuchsia … I know we already have common loves! Thank you for your very kind words my dear! 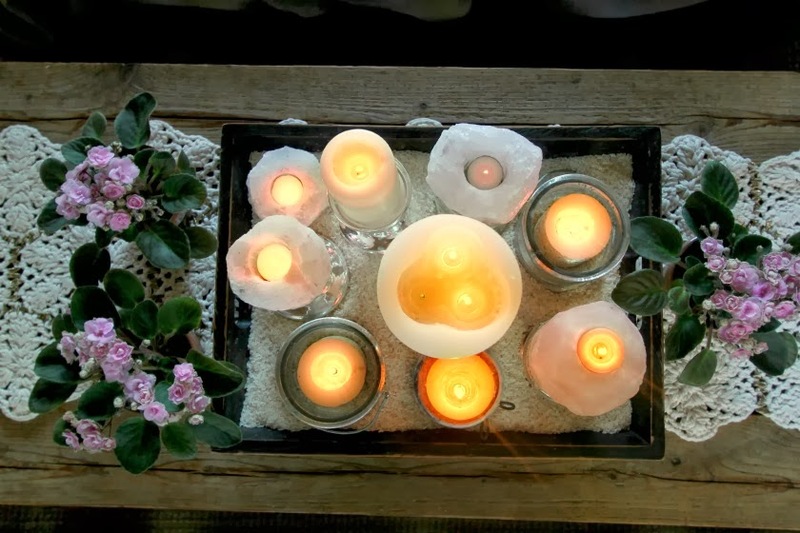 Okay , may I copy YOU!Love the idea of coffee and candles………..
La Contessa … so happy you have you visit! I just adore Jennifer from a Well Styled Life! It certainly sounds as you and have so much in common my dear! If you are ever in the area, I actually live in South Orange County, do look me up for lunch … I can only6 imagine all we would have to talk about!! So, do tell me which city?As I have relatives in NEWPORT and SAN CLEMENTE!I was just there two weekends ago for a birthday soiree!My SON went to CHAPMAN…….so ORANGE is a haunt for me too! What beautiful surroundings you create for yourself and your family. It's making me want to go out and buy some pretty flowers right now. Hello my dear … thank you so much for your visit today! Yes, flowers are such a joy … and working from home ... they really add daily happiness! I loved your INStyle shirt post today! Beautiful review my dear! Why thank you my dear … coming from your very stylish self that a quite a compliment! 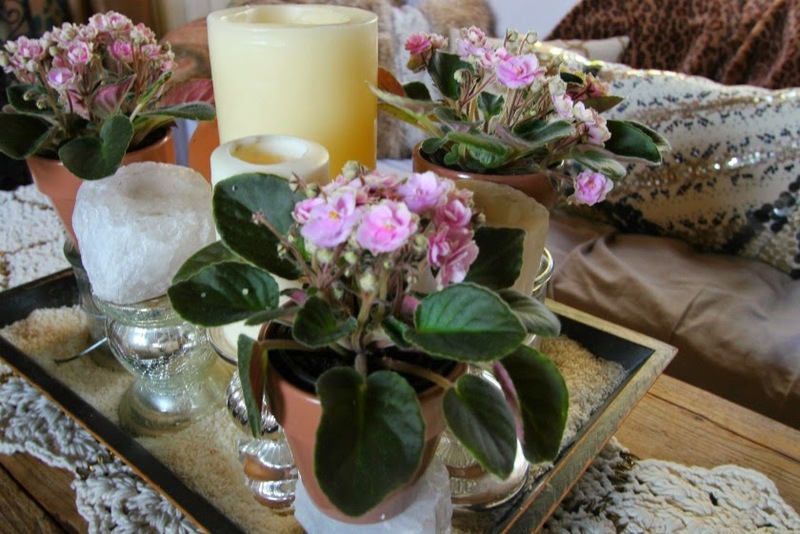 I do really like using living plants … other than the tender African violets … they usually move on out to my gardens when I change my interior seasonal colors. Much Love right back to you dear! Thank you ever so much for your rich words dear femme! I really like that …"elegant but never stuffy" ! that is always my intent … and you gave it perfect words! 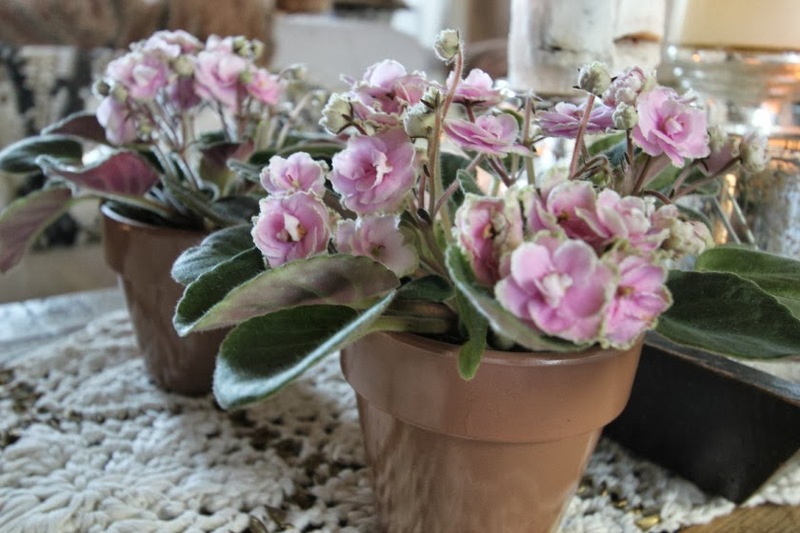 Cecilia my dear, you should definitely pick up some African violets … with just a little weekly water, low light and dead heading … they can sometimes last months! Flowers can add such joy to a space! Thank you so for your visit and your lovely sentiment! Welcome Liss … I am so happy you found me via the vey fabulous Faux Fuchsia! Thank you so very much my dear, for your beautiful and touching words! They are gifts to my heart! 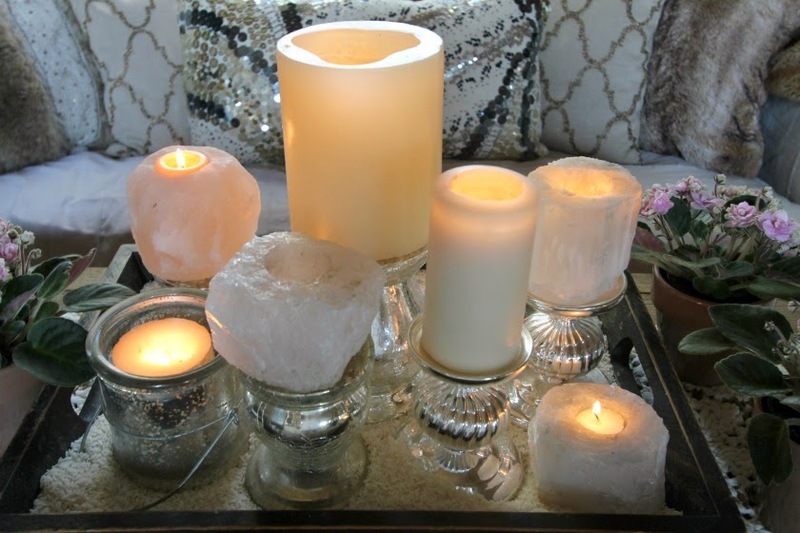 Tamera, Your home looks SO cozy and I like your morning routine of coffee and candles. 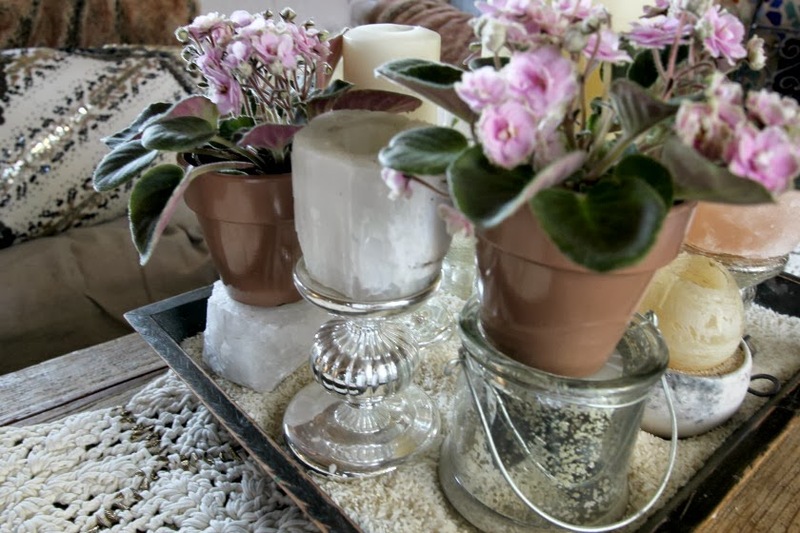 Your centerpiece is gorgeous and I love the African Violets and Mercury glass votives in the wooden container. Very pretty!! Thank you dear Leslie ! I know how very skilled you are around the table … your your complimentary words are most welcome! I always enjoy your visits my dear … I can't wait to get over to your space … and catch up with what you've been up to! Absolutely beautiful..... please tell me you will share this at my hop today Hugs! Thank you Katherine! And thank you for your kind invite to your very popular blog hop … I will be there! I love this idea. Especially the live plants. Thank you Suzanne! Yes, using life plants gives so much more longevity to using flowers to add joy to a space! 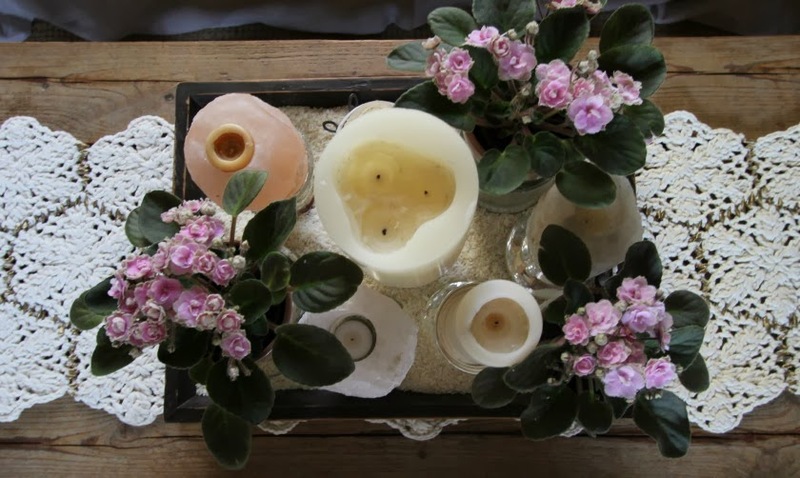 Tamera, Love your beautiful group of violets and candles. The idea of coffee and candles in the morning is so nice! Why not start the day in such a lovely way? I also really enjoyed the other posts, especially about mothering. Ah,so easy to get bitter instead of appreciate with all the daily strife that sometimes happens. Your positive and grateful tone always makes me happy. Thank you for the lovely inspiration. Kim, my dear, thank you for your sweet and comforting words! When my kids were younger …starting my day with coffee and candles was the perfect antidote to a busy day of motherly duties! Hang in there … it does get better! Thank you my dear! Right back at you … with gratitude!